Along with his brother, Samuel (1784-c.1825), Henry Thomas Alken was a painter and printmaker well-known for his sporting scenes. Samuel Alken disappears from view in 1825, with no more known of him after this date. His work is sometimes confused with Samuel senior, his fathers. 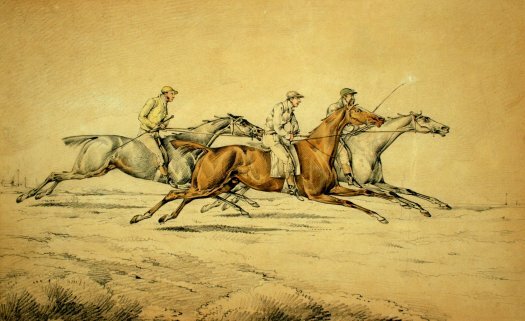 Henry Thomas began adult life as a trainer of horses for the hunt, but being part of an artistic family, took lessons as a draughtsman and printmaker, and around 1810 turned to this as a full-time career. His illustrations for the publication Indispensible Accomplishments or Hints to City Gentlemen (1815) immediately established his success, and he went on to produce prolifically, as both painter and printmaker. His prints were ususally done with the techniques of aquatint and soft-ground etching, and in the early days were usually published under the pseudonym of Ben Tally Ho. His drawings and prints for publications were much sought after in the years 1820-40, but Henry Thomass fortunes declined in the last years of his life and although he continued to work prolifically, he died penniless.